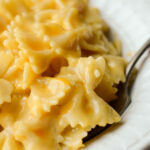 This mac and cheese is made with real ingredients, and only dirties up one pot! 1) Bring a pot of water to a boil. GENEROUSLY salt the water. It's critical to salt the water enough, otherwise you pasta will be tasteless. Add the pasta and cook to your preferred doneness. Drain and return pasta to pan (I like to use a pot with a draining lid). 2) Add the butter to the still-hot pasta, cover and allow to melt a bit. Add the cheese and cream and give it a good stir. Put the lid back on and let it rest a bit. Give it another stir after a few minutes. Everything should come together into a smooth sauce. Taste and season with more salt if needed. Serve immediately. 3) Store any leftover in the refrigerator. Make sure to add a little cream to the pot when you reheat; otherwise the cheese will separate.